The Blue Lagoon 3 – 4 hrs 59 USD per person entrance fee (starting price). Must book in advance. Sadly this is the last full day of our 2 Weeks / 14 Days Iceland itinerary. Today we’ll spend time doing more typical tourist activities: walking around Reykjavík and soaking in The Blue Lagoon. Tomorrow you’ll clean your camper and head to the airport. NOTE: Read about our experience with Kuku Campers here. Our last quick waterfall stop in Iceland is located a short 15 minute drive from the Skjòl Campground. Faxi may not be as amazing as some of the cascades we’ve seen over the past two weeks but it’s small and scenic nonetheless. Spend 15 minutes admiring the falls. TIP: A cafe is located next to Faxi. Downtown Reykjavík is 1 ½ hours from Faxi. TIP: Parking in Reykjavík can be difficult to find. Read the information on Reykjavík parking zones in our Iceland Planning & Resources post. 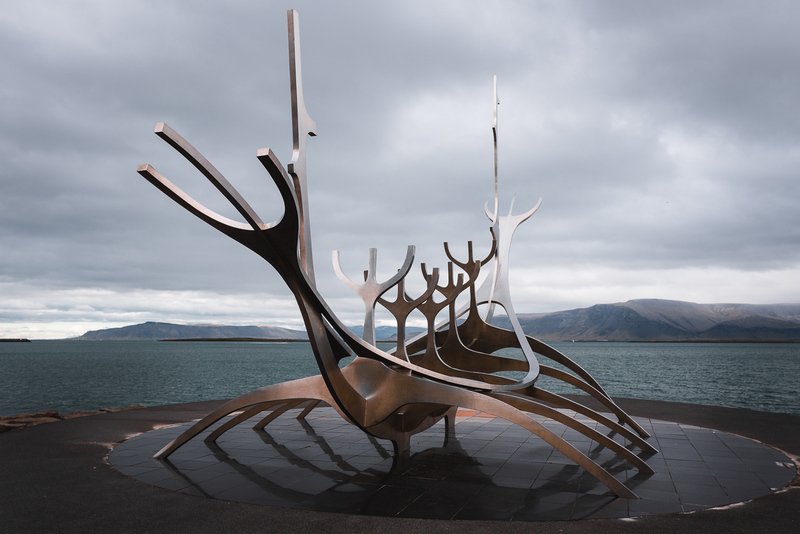 One of the less expensive parking zones is conveniently located near the tourist attractions of the Harpa Concert Hall and the The Sun Voyager sculpture. TIP: Free public restrooms are located in the Harpa Concert Hall. Reykjavík offers a lot of different cultural and dining opportunities. See the map below for various Points of Interest. Spend the day however you wish but don’t forget to visit the famous Hallgrímskirkja church that symbolizes mountains and glaciers with its hexagonal columnar basalt (like we observed at Reynisfjara Beach, Svartifoss, and Hengifoss). After enjoying a day in Reykjavík, our last experience was quintessential Iceland tourism: The Blue Lagoon. TIP: Pre-booking online is mandatory. Per person costs start at 59 USD with many optional add-ons available. We planned for this to be our last Icelandic experience and booked an evening time slot of 18:00. By now you’ll have (hopefully) visited one or more public pools/hot springs and are familiar with the etiquette and rules. Unfortunately, we observed most tourists (that’s who is here!) not following any of the hygiene rules, such as showering without a swimsuit before entering the pool area. Don’t be that person please. And, regrettably, this brings us to the end of our activities in Iceland. We hope you enjoyed your visit as much as we did. Our final night is spent at Grindavik Campground, a ten minute drive from The Blue Lagoon and twenty minutes to Keflavik International Airport. The campground has a very large indoor kitchen with ample supplies left-over from campers ending their journey at Grindavik Campground. Gender-separated restrooms can be found across the parking lot from the main facility building. A campsite at Grindavik Campground costs 1800 ISK per person. Day 14 covers points 67 – 71 on the map layer Our 2 Week / 14 Day Itinerary.